This book is a gem. First, it is a breakthrough in teaching qualitative methods, and second, it shows how teaching and research can be enriched by grounding both in community. A book that does this sits at the tip of innovation in improving the conduct of research and in teaching it. Let me provide a little background. There has been a revolution underway for quite some time in both conducting research and in teaching it that has been barely noticed apart from those of us who teach the subject. Research methods used to be literally esoteric knowledge intended for only a brilliant few. The entire purpose of an introductory class in research methods (and statistics) was to weed out the unqualified majority of students and to identify the few who could embrace its abstract complexity. The purpose of this sort of teaching was not to improve the conduct of research, but rather to advance the subject’s sacred canons expressed primarily in mathematical proofs into the next generation. More importantly, there was virtually no overlap between what was taught as methods in textbooks and what one actually did as research in the field. The few who actually did research had to learn it by apprenticeship. The revolt against this arrangement has been ongoing. The need to understand and address urgent social problems quickly out-ran the ability of the temple priests to prescribe meaningful methodologies. In no challenge was this more apparent than in the need to understand and prevent a sexually transmitted communicable disease such as AIDS. Furthermore, prevention had to be done among people almost no one in the academy knew anything about. Research as it was actually done had to be practically codified for the first time for a new generation of investigators to go out and get real answers to real problems. People’s lives depended on getting accurate information. In these efforts, it was realized that one could not even begin to devise testable hypotheses starting with quantitative approaches. It is necessary to first have a great deal of background information about one’s topic before one can even begin to test hypotheses. When you do not have this background, you simply cannot do meaningful quantitative research. Qualitative approaches that generated the extraordinary insights about pre-World War II American society were reluctantly revived. They had been initially dismissed as passé and as non-science. Ethnography, participant observation, interviews and case studies are all techniques used to engage real people in real communities. These approaches have turned out to be essential for generating sufficient knowledge and insight about human behavior, attitudes and values to make quantitative approaches possible. The more insights derived from qualitative research, the better the results of quantitative tests of those insights. Therefore, it makes sense to emphasize teaching and conducting qualitative research as the leading edge of expanding our knowledge of the social world. It also makes sense to do it in a way where it is taught as it is practiced. Methods texts focusing on qualitative research have been evolving in this direction for some time. What is unique about this book is that it takes the next step. It takes the teaching of qualitative methods out of the classroom and into the community. Professor Ernest Quimby takes a bold step here that could easily be overlooked. The fact is no research on human individual and social life is done outside of a community context. This is fact; no one does research which does not engage community, even when they try to avoid them. But here this fact is not only acknowledged; community is consciously and intentionally built into the teaching narrative and exercises. Those who engage in research and pay attention to community settings will immediately recognize the importance of this innovation and the essential content. By integrating community into the heart of methodological consideration, it is possible to further improve the conduct and the outcome of both teaching and research. This book is a gem not only because it demystifies temple knowledge and codifies how actual research is done. It also improves the teaching of methods. Instead of standing off in the distance from students and imparting to them curricular content in a one-way dialogue, Prof. Quimby makes students partners in exploration. He does so by making the content and task of teaching explicit and personal. Teaching in this way models both research as an exploration of unknowns and as a community engagement. In this sense, I bet that more students who use this text will understand research as a process of exploration five years after the course than students taught more traditionally. The approach and content here are a step forward also because they demanded clearer writing. When teaching research is merged with how research is actually done, there is no room for the esoteric. The writing is clear, straightforward, to the point and the essentials are outlined and covered. It is a step forward when students not only are presented the essentials of doing research, but they can also see what their instructor is trying to do and why. Furthermore, it is virtually subversive that community people who are potentially research subjects are engaged teaching research as well. They too can and should play a part in making sense of qualitative and quantitative findings about their lives. Finally, this book is not a dumbing-down of the subject matter or a vulgarization of temple knowledge. 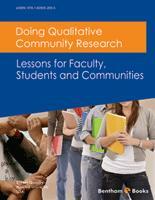 It is a bold and straightforward improvement of teaching and of explaining how to do qualitative research. The more thorough is the qualitative knowledge of as wide a range of students as possible, the more likely brilliantly insightful work will emerge from them. Community-based research can only get better when it is well understood in the general public and when community people know that they can play a part beyond simply being research subjects. I am thrilled to write the Foreword for this work and to get an early look at a quantum improvement in teaching qualitative research. I am certain that if you explore this book you will agree. Research is about choosing. It requires asking and answering core questions, such as: What do I (or we) want to do, and why? Who will do it, and how? When will it be done, and why? Where will it be done, and why? How will it be done, and why? Research involves more than selecting a series of procedures. One of my aims is to help myself and others make better choices about research. Preparing this text was almost a transformative experience for me, trained in a positivist, old school model of empirical investigation that only valued observable realities, third person objective detachment and rules borrowed from quantitative approaches. I was taught never to interject myself into the research process and presentation – as if I did not exist and had no bearing on research conceptualization, design, approach and analysis. In a sense, I was conditioned to emulate quantitative perspectives of supposed value-free neutrality, even while protesting that this was not possible. I resisted. Struggling to locate myself within a framework of questioning, if not challenging, dominant perspectives, required me to rethink notions of validity, reliability, authenticity and credibility. Questions kept returning: Who am I? What do I stand for? With whom do I stand? Why? In struggling for an authentic self and a genuine voice, it became clear to me that authentic research is more than conceptual design and technical methodology. I want myself to be different in the world. This ‘being in the world’ meant developing alternative relationships with research participants and viewing them as the ultimate interpreters and validators of their reality. My book is not an exhaustive description. It contains discussions and suggestions on the meaning and forms of qualitative community research (QCR), classroom instruction, practical application, fieldwork, assessment strategies and resources. It is necessarily abbreviated because qualitative literature is expansive, detailed and comprehensive, comprising an over 50-year-old distinctive approach. Ethnography is emphasized. The book is not menu driven or a how-to conduct research manual, but practical examples and recommendations are provided. It has several premises: Student-centered learning, rather than teacher dominated instruction, is the preferred foundation for pedagogy, curriculum development and educational practices. QCR is best learned by thinking, questioning, reflecting and applying. QCR involves interacting with others. QCR is not merely a strategy. QCR objectives for teaching, student-learning and community assistance can be accomplished. Multiple approaches are possible, although my text highlights observations and presentations (narrative, oral and visual) by faculty, students and neighborhood residents. Working with a community organization helps to conceptually and practically connect qualitative theory, pedagogy and research methods. Joint presentations are possible that have meaning for participating collaborators. Planning, conducting and reflecting about thematic research are fundamental for instructional coherence and integration. Synergy between faculty, students, residents and course content is enhanced. This textbook focuses on ethnography, since it is a major form of qualitative research. Many of the examples are related to gentrification, community development and mental health services research. These reflect some of my interests and specializations. However, the book is for anyone interested in qualitative research concepts, methods and uses. Readers will become familiar with or reacquainted with QCR concepts and methods. Important considerations are summarized for conceptualizing, designing and carrying out qualitative research in community settings. The text is a supplemental synthesis and reinforcement of core issues. Instructors and students can use it for lessons and assignments. Working in, with and for communities is not easy. Doing meaningful QCR requires identifiable types of consciousness, values, attitudes, skills, information and reflection. Before starting my work, I thought not much more could be written about qualitative research. I was wrong. The field requires continuous reasoning and description. →How can QCR be taught, learned, applied and evaluated? →How can QCR assist instruction, learning and service? →Should QCR promote social justice?